Vera Farmiga & Christopher Plummer Attend Special Screening of 'Boundaries' in NYC! Vera Farmiga and Christopher Plummer are celebrating their new movie! The actors were both in attendance at a special screening of Boundaries co-hosted by The Cinema Society and the Hard Rock Hotel * Casino Atlantic City on Monday (June 11) at The Roxy Cinema in New York City. The event was also in partnership with North Shore Animal League America, so the celebs posed with adorable puppies! Lewis MacDougall, Peter Fonda, Dolly Wells, writer/director Shana Feste and Sony Pictures Classics co-presidents Michael Barker and Tom Bernard were also in attendance. Co-host Beth Stern, Patrick Stewart, Sunny Ozell, Patrick Wilson, Dagmara Dominczyk, Sami Gayle, Anna, Grace Van Patten, Willa Fitzgerald, Ben Younger, Michael Cunningham, Jeremy Carver, Laura Michelle Kelly, Simon Kirke, Nanette Lepore, Marina Rust Connor, Daniel Benedict, Carole Radziwill, Jennifer Creel, Antoine Verglas and Cinema Society founder Andrew Saffir all celebrated at the event. 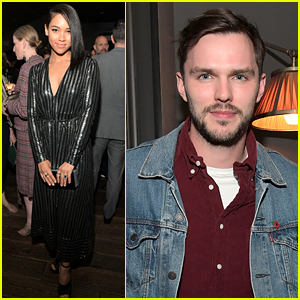 Nicholas Hoult and Alexandra Shipp step out for Vanity Fair and Genesis’ celebration of Fox Searchlight and 20th Century Fox’s Nominated Films on Friday (March 2) in Beverly Hills, Calif. The two actors star in the X-Men franchise, which is distributed by Fox. Fox Searchlight has 20 Oscar nominations this year thanks to Three Billboards Outside Ebbing, Missouri and The Shape of Water. 20th Century Fox has seven nominations from The Greatest Showman, War for the Planet of the Apes, Logan, The Post, and more. Also in attendance at the event were Three Billboards‘ Abbie Cornish and Caleb Landry Jones, The Shape of Water‘s Richard Jenkins, Doug Jones, and director Guillermo Del Toro, War for the Planet of the Apes‘ Andy Serkis, Logan‘s Patrick Stewart with wife Sunny Ozell, as well as Bradley Whitford with girlfriend Amy Landecker. FYI: Alexandra is wearing a Jennifer Meyer ring. Abbie is wearing an Elie Saab shirt and pants. Margot Robbie shines on the red carpet as she arrives at the 2018 EE British Academy Film Awards Nominees Party at Kensington Palace on Saturday (February 17) in London, England. The 27-year-old actress went glam in a white knit dress and gold heels as she was joined at the event by her I, Tonya co-star Allison Janney. Other stars at the event included Salma Hayek Pinault, Annette Bening, Greta Gerwig, Sam Rockwell and longtime love Leslie Bibb, along with Patrick Stewart and wife Sunny Ozell. The 2018 BAFTA Awards take place tomorrow afternoon, Sunday February 18. FYI: Margot is wearing a Chanel dress and Gianvito Rossi heels. Salma is wearing a dress by Gucci. Anya Taylor-Joy Celebrates Being One of 10 Brits to Watch! Anya Taylor-Joy shows off her style on the red carpet at the Newport Beach Film Festival Annual Honors event held on Thursday (February 15) in Manchester, England. Despite the film festival being California-based, the event was held in England to celebrate Variety‘s list of the 10 Brits to Watch. Anya is one of the 10 stars on the list this year! Some of the other stars who stepped out for the event Thomas Brodie-Sangster, Jason Isaacs, Andy Serkis, Patrick Stewart with wife Sunny Ozell, and Eleanor Tomlinson. FYI: Anya is wearing Gucci with Alinka jewelry.